This DTC indicates that there is a problem with output signals from the automatic transmission fluid (ATF) temperature sensor and that the sensor itself is defective. The ATF temperature sensor converts the ATF temperature into an electrical resistance value. 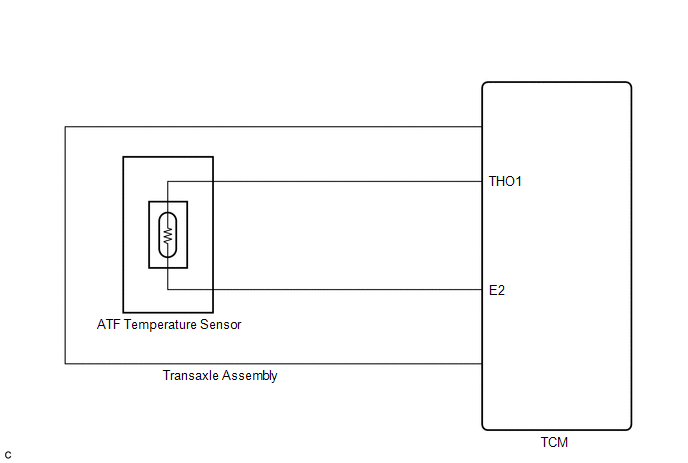 Based on the resistance, the TCM determines the ATF temperature and detects an open or short in the ATF temperature circuit or a fault of the ATF temperature sensor. After running the vehicle for a certain period, the ATF temperature should increase. If the ATF temperature is below 20°C (68°F) after running the vehicle for a certain period, the TCM interprets this as a fault turns on the MIL, and stores the DTC. Condition A, B, C and D: 3 sec. Duration time from shifting to "N" or "P"
If DTCs P0711 and P2610 are output simultaneously, confirm that the ATF temperature is as specified in "Normal Condition" using the Techstream first. When the ATF temperature is as specified in "Normal Condition", perform troubleshooting for DTC P2610 (See page ). In the table below, the value listed under "Normal Condition" are reference values. If a circuit related to the ATF temperature sensor becomes open, P0713 is immediately set (in 0.5 seconds). When P0713 is set, P0711 cannot be detected. If any other codes besides P0711 are output, perform troubleshooting for those DTCs first. (a) Check the transmission fluid level (See page ). Automatic transmission fluid level is correct.